Let's get ready to rumble! In fact, let's take 4 or 5 weeks to prep... sorry, this has been my Friday project since mid-May, but no more stalling! Time for Blue Bunny and Skinny Cow to have a match up. To make it fair, we're going to compare their reduced fat ice cream cookies n' cream bars. As a disclaimer, technically these were both free, though the skinny cow coupon was technically a replacement coupon for a prior bad experience. So you walk into a store and see these two side by side, which do you buy? Now this is Blue Bunny's NEW! 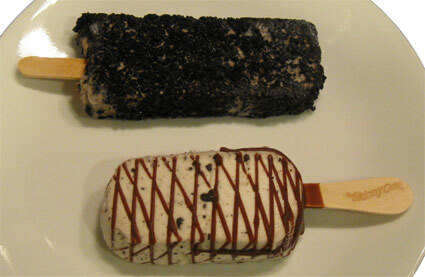 Cookies 'n Cream ice cream bar and already this is more of what I expect. It's cookies 'n cream reduced fat ice cream with chocolate cookie crunch topping. These are 3 oz bars with 190 calories, 80 of which come from fat. Hmmm, tough to call outside the box... HA, I meant that figuratively at first. Anyway, I think skinny cow does a good job of catching the diet crowd with the chocolate drizzle. 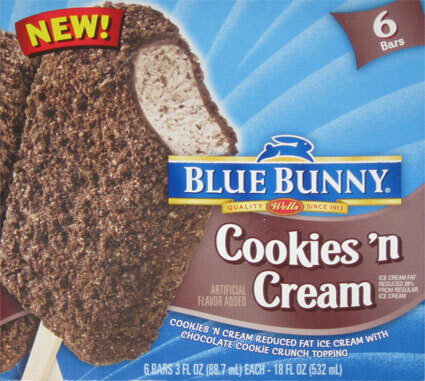 However, I think blue bunny is going to grab the average joe with the nice looking cookie crunch layer. I'm going to call this round a draw. Hmmm, well. 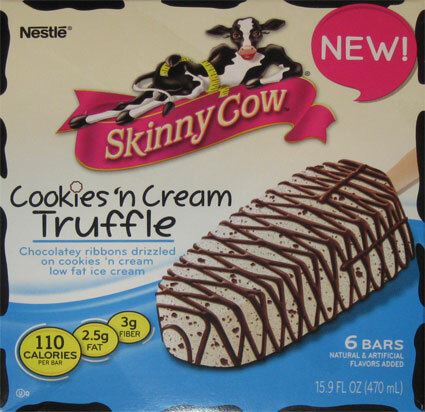 I'm actually surprised the Skinny Cow treat looks so close to the box picture. I guess I half expected like three drizzles over the entire treat and that's it. On the flip side, I expected the Blue Bunny treat to not be as pretty as it's packaging. Let's take a look at the profile shot so we can really drive home the differences here. While the Blue Bunny treat may be taller, it's gotta be 30-35% thinner than the Skinny Cow treat. You know what really has me scared though? Blue Bunny has that nice thorough cookies 'n cream look to it's center, while skinny cow is much whiter and the bits are scattered (though occasionally bigger). Again, they both have good points. Skinny cow is a mighty treat with a pretty drizzle, but deep down it looks like a oversized slab of ice cream. The blue bunny treat isn't perfect, but I know it's cookies and cream. I look at it and I know exactly what to expect. I'm know I'm biased, but I'll give the slight edge to blue bunny on this one. Well, this has certainly been a close one so far. I guess that's the point of cookies 'n cream. It's meant to be simple. In my fuzzy recollection, it's basically one of the first main stream flavors to come out after vanilla, chocolate and strawberry. So, companies have had more than enough time to work out the kinks, so let's dig in. I couldn't help myself and went for the blue bunny first. Mmm, just as I expected. A non-robust but tasty tribute to CnC. It tastes like low fat CnC ice cream surrounded by somewhat soft cookie crumbles. I know it says crunch, but there's no crunch here. I flip over to the Skinny Cow and the first thing I say is: this is weird. You really have to think about how you are going to eat this. If you just bite it, the whole point of the drizzle is lost. If you treat it like a popsicle, well, the texture is weird shall we say. I mean, you will get a bit of so-so chocolate taste to get you started if you go that way, but it won't stick on the bar long since there's nothing really holding them on. Underneath is a big slab of skinny cow's very low calorie ice cream. I know as a lover of super premium ice cream that I am always hard on this stuff, but to me, it's just too low fat. Maybe they need to churn it a few more times or something. I stop eating and am left with a bit of that weird skinny cow aftertaste. Back to Blue Bunny... ahhh, that's better. It's a shame they don't make a full calorie version of this... oh, wait, crazy idea: Monster Cookies 'n Cream Ice Cream Bar. That would rock! (Blue Bunny, call me!). Anyway, this treat would definitely benefit from a thicker ice cream, and a bit more of it, and ofcourse a few more crumbles, but overall, it's exactly what I expected. My biggest problem is that I sometimes feel like I need two of them to be full. Well, the first two rounds went well for both parties, but then Blue Bunny blew Skinny Cow right out of the ring in the third. Hey, that's how these fights go sometimes. I am a "healthy" eater and WW lifetime member and I also despise the Skinny Cow ice cream products - they just don't taste good and the aftertaste is the worst. Glad to hear this new Truffle Bar isn't worth it. Shame you didnt enjoy SCs version, at least the BB you enjoyed! I love Skinny Cow. I have to watch what I eat and if it means I can have ice cream, even if it must be low fat, I'm happy they make it. I think their fudge bars are great and the ice cream cones are the closest I'm getting to an ice cream cone anytime soon. Wish I could eat premium ice cream but with an extremely slow metabolism you won't find me complaining about skinny cow. Dubya, ya know what I think: you eat too much of the good stuff (real stuff) to put Skinny Cow in the right perspective. I actually love those bars, mostly because of the drizzle. But I'll pretty much like anything frozen and chocolate on a stick, so take that for what it's worth! I guess the best thing to say here is that I've had much better luck with weight watchers than with skinny cow.... but better yet, have some double churn from Turkey Hill or one of the other national companies, you'll save a fortune and it will taste better. I agree with adam. These things are pretty good for what they are. I'd never compare them with real ice cream treats because they truly aren't but I still like them, especially the caramel ones.